I love learning new things- and working with Photoshop is one of those things that I am compelled to learning right now. My goal in this little painting was to 1) have a look and feel form a 50's advertisement and, 2) to make my photoshop paint look like "real" paint. 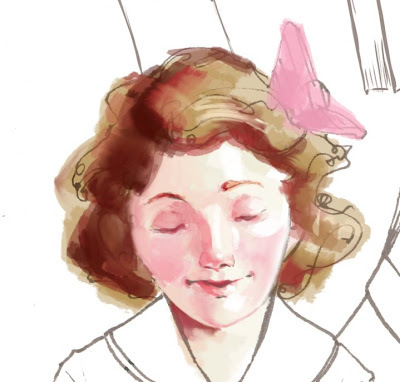 Here I am giving the illusion of watercolor for hair and acrylic paint for skin and ribbon. How do you think I did? I am telling you, this is pretty fun stuff! The best part is, I know I can only get better!